Could FUE be for you? FUE is a harvesting technique where the individual grafts are punched or ‘drilled’ out from a shaved area of the donor scalp. Although scars are still produced, they are usually very subtle dots scattered over a large area making it possible to conceal even with a cropped hair cut. It is ideal where the patient needs or favours a shorter hairstyle, such as a No.1 or No.2 cut or any hair charactertistics that make the scalp easily visible – but we would recommend a personal consultation to ensure that it is the right treatment for you. While no two FUE procedures are ever exactly identical, they do follow the same essential steps from start to finish. Here’s an insight into what you can expect upon entering a surgical hair solution surgery. Having discussed your hair loss and the treatment options available to you at your consultation with one of our experts, you decide on FUE and book an appointment for your treatment. 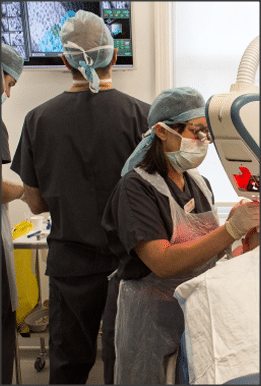 Once the anaesthetic has taken effect, the procedure begins with the extraction of the follicular unit grafts – this is done manually or mechanically using 0.8mm – 1.0mm ‘drill bits’ and a variety of other equipment. With the expertise we can offer at every stage of the procedure, we can produce results that are virtually undetectable – even under the closest scrutiny.